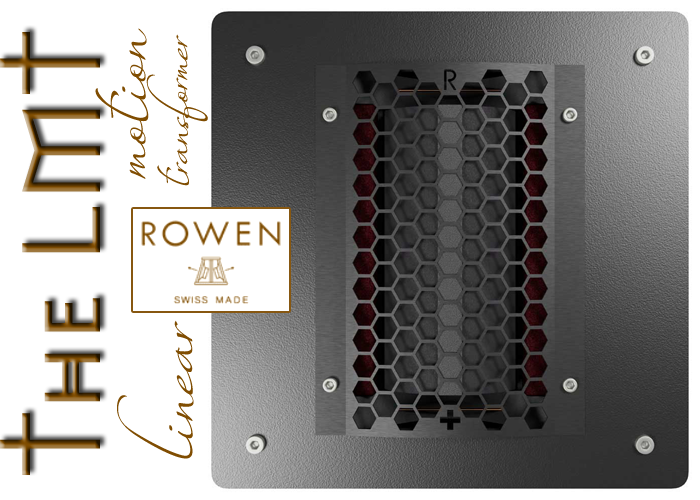 Swiss electronics brand Rowen have developed a new 5-octave mid/tweeter transducer which is claimed to improve over all pre-existing electrostats, magnetostats, ribbons, bending-wave drivers and air-motion transformers. Dubbed LMT or linear motion transformer, it works without mechanical suspension or any surface deformation of the diaphragm. Driven from four extremely powerful Neodymium magnets for a combined pull force of 140kg through a freely embedded not fixed dual voice coil, the activation of this cylindrically shaped driver—which looks to perhaps be conceptually related somewhat to Anthony Gallo's CDT™— is said to be directionally restricted to guarantee superior mechanical stability. Development of the driver was initiated by Markus Trachsel, enthusiastic user of Rowen equipment and owner of the Swiss Seeland-Multimedia AG and Hifi Glanzmann establishments.